Achieving sustainable development is critical to the human quest for global survival and environmental preservation. Increasingly, the aim is extending across a broad multidisciplinary policy canvas, impacting on economic, social and cultural spheres of thought. Access to sustainable healthcare, education, food and water are some of the important sustainability challenges society faces, and it is in these fields that three young researchers recently received commendation for their cutting-edge work. Arul Chib has been using Information and Communications Technology (ICT) as a tool for providing medical information (mobile health) and learning opportunities to children and youth in remote communities; Rajeev Bhat’s research on wild legumes explores nutritious and available alternatives to food supplies, based on local practices and traditional knowledge; and, Junguo Liu’s work on water and ecosystem services strives for a more sustainable approach to water consumption. The awardees’ applied research and contribution to the communities to which they are connected are a common feature of the ProSPER.Net-Scopus Young Scientist Award in Sustainable Development, given annually to young scientists and researchers based in Asia and the Pacific. ProSPER.Net aims to integrate sustainability issues in different fields of postgraduate curricula, with the award categories changing every year in order to promote applied research in different fields of endeavour. 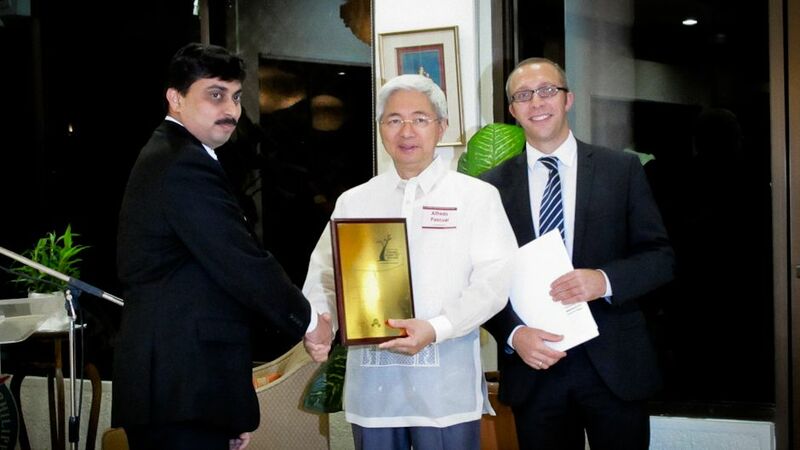 The University of the Philippines hosted the 2011 symposium and award ceremony in July. Award categories covered the areas of ICT for Sustainable Development, Science and Technology with a Focus on Poverty Eradication, and Biodiversity and Natural Resource Management. A panel of three experts in each of the areas selects three finalists to present their work at a symposium, as part of the judgement process. Criteria to select winners include the number and quality of publications, citations and patents of a researcher’s work, as well as documented social impact. Winners receive a cash award and are offered a fellowship provided by the German Federal Ministry of Education and Research, allowing them to spend up to a year collaborating with any institution of their choosing in Germany. Arul Chib from Singapore’s Nanyang Technological University was the 2011 winner in the category of ICT for Sustainable Development. He has been working with ICT applications for health and education and through his interventions, providing better health care to communities in remote areas of countries such as China, India, Indonesia, Nepal, Peru, Singapore, Thailand and Uganda. Making use of the extensive mobile phone diffusion in developing countries, Chib worked with mobile phone and data sending technology to improve communication and medical information between health workers and local communities. In Aceh, Indonesia, an area affected by the tsunami in 2004, this method proved to be effective, decreasing the response time in critical cases. It also helps stimulate a preventative approach to health care by facilitating communication between rural midwives and the urban health infrastructure, leading to improved maternal and infant health. Mobile health for specific groups has been also applied in Nepal, mainly in delivering health care for women. In China, it has been an important tool for doctors working in remote areas to access useful information. Chib has also developed educational multimedia games that expand learning opportunities for children as part of rehabilitation activities in disaster-affected areas, such as Indonesia, as well as interactive multimedia games with educational content related to reproductive health, particularly HIV/AIDS. While ICT has become a profitable (and in some cases lucrative) area of business in developing countries, the award is also keen to reward research in less considered sectors. “There are not many avenues for recognition and support for young academics in this area; government and industry support is much more common for more obviously profitable areas of research,” said Ed Cutrell, panelist of the ICT for Sustainable Development category. In the category of Science and Technology with a Focus on Poverty Eradication, the winner was Rajeev Bhat from Universiti Sains Malaysia. Concerned with global levels of malnutrition and poverty, Bhat’s work focuses on wild legumes and its nutritious elements as an alternative local food supply. Establishing wild legumes’ bioactive compounds, pharmaceutical value and anti-nutrients, Bhat was able to indicate the nutritional value and functional properties of different species that can be found in Asia (Mucuna pruriens, commonly known as devil beans); and Africa (Canavalia sp., also known as sword or jack beans, among others). With his research findings, he has been able to identify low-cost, healthy and safer sources of protein among wild legumes, providing a scientific basis for local practices. He has been using traditional knowledge not only to identify other types of legumes but also to determine food-processing methods to remove anti-nutrients, making them safe for edible purposes, and to enhance bioactive elements, such as antioxidants, flavonoids and others. Bhat has also observed that wild legumes may lead to better use of land, being an efficient element in crop rotation, promoting agricultural development and consequently improving farmers’ economic self-sufficiency. A young professor at Beijing Forestry University, Junguo Liu, won the prize in the area of Biodiversity and Natural Resource Management for his research on sustainable use of freshwater and ecosystem services and management. Part of Liu’s work is assessing the use of green water (stored in soil from precipitation) and blue water (from rivers, lakes, reservoirs, ponds and shallow aquifers), which has led to increasing attention to green water management. Green water’s importance for agriculture and thus food production is noticeable since according to his findings, around the year of 2000, 84% of the water used for agricultural purposes in the world was green water. The efficient use of green water may also contribute to the long-term existence of agricultural production in countries where the economy relies heavily on this sector. The hope is that poverty levels can be reduced through promoting rain-fed agriculture. Liu has also been developing research on water footprints, focusing on water assessment and the environmental impacts of direct and indirect water use. This work led him to collaborate with the United Nations Environment Programme International Panel for Sustainable Resource Management, to develop a report on water footprints. He has also worked with the private sector regarding corporate sustainable water use, building awareness and assisting companies, mainly in China, to reduce their water footprint and environmental impacts in their supply chain. In addition to these, Liu’s work has been influential in his country. He advised the municipality of Beijing in establishing a series of restoration objectives for the Yongding River and participated in the assessment project of China’s Ecosystem Services and Management that recommended the adoption of a new National Plan on Ecological Conservation and Development. Although scientists are stereotyped as staying in their laboratories, focused on research to find solutions for specific problems affecting humanity, the three young award-winning scientists continue to move beyond academia. All three, and many others not yet awarded, are looking at the world’s current problems creatively to obtain outcomes that ultimately promote social inclusion, improve livelihoods of poor communities in particular, and in the process, stimulate a better understanding and use of natural resources. Aware of the need to influence policy in order to scale up local solutions developed and implemented in their communities, the winning researchers are also providing scientific knowledge to different stakeholders, including local authorities, national governments, NGOs, the private sector and international organisations. All three have been rewarded for their success in opening up common languages to address problems spanning a wide range disciplines and affecting a variety of actors. The ProSPER.Net-Scopus Young Scientist Award in Sustainable Development is a joint initiative of ProSPER.Net, an alliance of higher education institutions located in the Asia-Pacific, created under the auspices of the Education for Sustainable Development (ESD) Programme of the United Nations University Institute of Advanced Studies (UNU-IAS), and Elsevier, a publisher of academic information, mainly through Scopus, the largest global database of peer-reviewed literature. For more information on the award, winners and runners-up, visit The UNU-IAS page on the topic. A shorter version of this article was published in the UN Chronicle, ‘The Digital Dividend’, Vol. XLVIII No. 3, 2011. Awardees Tackle Sustainability Challenges by Aurea Christine Tanaka is licensed under a Creative Commons Attribution-NonCommercial-ShareAlike 3.0 Unported License. Aurea Christine Tanaka is a Research Associate with the Education for Sustainable Development Programme at the United Nations University Institute of Advanced Studies (UNU-IAS) in Yokohama, Japan. Debate: Is Sustainable Development Still Relevant?